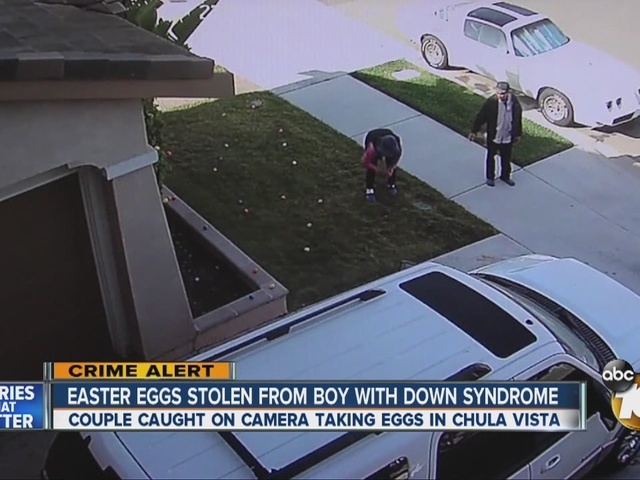 A Chula Vista family says the first Easter for a boy with Down Syndrome was ruined by a group who stole every egg off their front lawn. Janet and Michael Ford say a neighbor decorated their yard with dozens of Easter eggs for their son Gabriel's first real Easter. The couple says they have been practicing picking things up and putting things in baskets with Gabriel, who will turn two years old in April, and they were looking forward to doing an Easter egg hunt with him and their three other sons. While the family was away at church, their security camera caught a couple walking by their house. The video shows them taking a few eggs out of their front yard and leaving. A little while later, the woman comes back with two children and they take the rest of the eggs in the yard. Unfortunately, it doesn't stop there. The couple comes back a third time at night and cuts all the Easter eggs off the trees. The Fords say they aren't the only family targeted; they say the couple cleaned out at least four other families' Easter eggs too. "It's disappointing," Janet said. "Please don't steal from kids. Don't do that." They are turning all the surveillance video over to police and making a report. "Social media is a powerful thing," Michael said. " Mom's can be a force to be reckoned with."